Please note the last two lines in the list above. 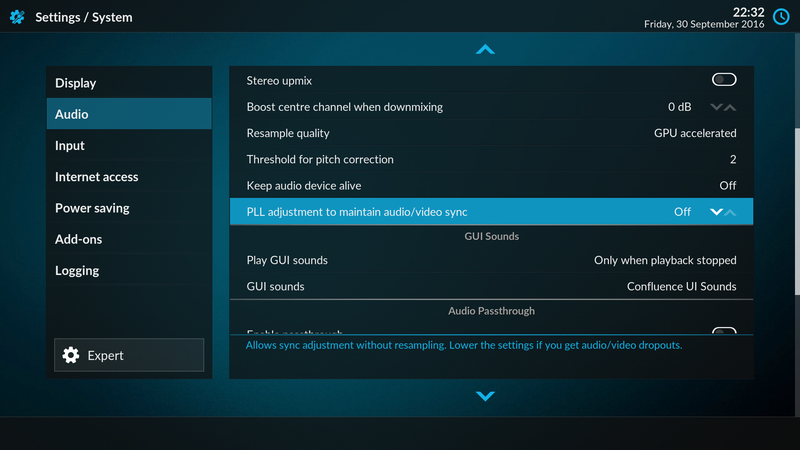 The LibreELEC settings add-on has not disappeared, it has moved from the home screen menu into Kodi settings. No new Kodi build included? Err.. well, the first sentence of the post says “containing Kodi v17.0-beta2” and the previous alpha had v17.0-beta1 so I don’t know what else you were expecting? LibreELEC (Krypton) 8.0 preview builds continue with v7.90.006 containing Kodi v17.0-beta2. If I compile LE according wiki what will be difference between my build and 7.90.0.6 ? Is there any patches inside of 7.90.0.6 which I will miss, if I will compile myself ? If you do “git clone -b 7.90.006 https://github.com/LibreELEC/LibreELEC.tv.git” your build will have exactly the same content as the official builds. The sole difference is the splash screen artwork. I prefer the confluence skin, and once I download and install it on LE 7.90.006, there doesn’t seem to be any way to access the LibreELEC specific settings unless I switch to Estuary. Is there a LE-specific version of Confluence that is included in the package, or that can be downloaded from a repo somewhere? I assume you could still access it via Programs -> Addons…. If not, then how to access on any other skins? Confluence should be installed (or reinstalled) from the Kodi official repo to ensure the version used is compatible with Krypton. As Matt said, the LE settings add-on can be accessed via the Add-ons menu. I installed 7.90.006 on C2, and there is audio issues playing any video; high pitched static. The player was mostly perfect in .005 but this bug in .006 makes it unusable. Had to revert immediately. Yup but vidéos are hardware decoded, in 05 it was software decoded. There’s no 3d MVC framepack and iso 3d are only in 2d. Don’t forget it’s alpha and work on C2 is quite new! No, in 005 it’s using hardware decoding just fine on the C2. My CPU is 2% and temps are very low, while playing h265 and h264. 005 seems to run really well for me with next to no issues (except maybe CEC not working 100% and jumping to points in video sometimes lags/freezes). Can’t wait for the 8.0 release when things ironed out. Same here, i’ve noticed that if you turn stereo upmixing on/off a few times whilst the video is playing that the audio fixes itself, but only for the duration of the file. I think I read a few blog posts ago, you were thinking about release LibreELEC without KODI (as a great minimal image). Maybe with docker-compose and docker-machine as well for good measure. I would imagine without KODI, this image would be tiiiiinnnnyyyy. You end up with something about 65mb including docker and the hacked together prototype boots in 5 seconds. It’s more than an idea but something that needs someone to really take the lead upon to bring to fruition. Support add HK RTC Shield in release 7.90.007? Is the auto update active? Im on 7.9.05 and i dont get a notification and even the manual search didn´t brought up anything. Same here. I guess @chewitt needs to enable it once again. Wetek Play 2 Builds in near future? In Build 7.90.005 there is a Fix for 5GHZ Connection for RTL8812au Wireless devices. Is this fix in the Actual Build too? I Installed this Build Tod Test but my Stick dont see the 5GHZ Band. Work it only on Lower Channel or DFS Band ( like Channel 100-108 ) too? Would be good if LibreElec 8.0 would ship with it. Meanwhile, 4.8 is out with yet other ARM improvements … What is the target kernel for LibreElec 8.0 ? It will be 4.8, but kernel major version bumps always generate a laundry list of things to fix and that takes time. It will go into 7.90.007 is specific patches are available in time; if not it will wait until 7.90.008. Works just fine on RPi3/RPi2 except few quirks in default skin ‘Estuary’ (bugs reported). Tried the latest “Alpha” on my RPi3. Overall the new skin looks for good, but I’m missing the Settings “Sync Playback to display” the option “PLL”. Without this option I always get microstutters like once a minute. I also have lost center audio during playback and some 3D MKV Playbacks have hangers when I forward by chapters. wetek play nand version hangs at splash screen at first boot..
Time for migration depends on how big the DB is that’s being migrated (and how many DB revisions have to be sequentially passed through) so long times can/do happen. If you see repeated issues it’s best to do a clean install and then selectively restore bits one at a time until you find the bit that’s corrupted/borked and causing the problem. Very nice release. On a NUC5PPYH the animations of the Estuary skin are quite jerky. Changing the cpu governor from powersave (the default) to performance makes them noticeably smoother. Have you thought about making performance the default governor? I wouldn’t think the difference in power consumption would matter for a typical media PC. Isn’t the default “On demand” ? The Generic x86 build uses “powersave”. The two options are “powersave” and “performance” – there is no “ondemand”. where can i change the cpu govenor ? I have also that NUC and i wanna try it out. The above change will take effect on reboot. To apply the change immedately type the same commands on the command line. You need the change to autostart.sh to make the governor sticky when you reboot. My .005 is still not auto-updating. Is there anything properly set up on the server? I’m guilty of over-sleeping the 24h deadline once in a while, but it’s been enabled for a while now. If a box doesn’t update .. enable additional HTTP logging and restart to get a clean log that shows detail of the initial check done after startup. How do i access the chrome download folder. I can only see it true chrome true storage\download. Not true samba. Sorry but I don’t understand the question. Please post in the forums in English + your local language. Please take a picture with a smartphone to show the problem if it helps to explain. Thanks. Have the issues on Odroid C2 been fixed. Like Deinterlacing and live TV in general? There are some patches to add software deinterlace for SD media but the video side of the AML kernel still needs lots of work. Im notice problem with Tvheadend plugin … im used remote TVheadend server + 3 diffrent RP2 as clients and all works fine. After upgrade one of them to v7.90.006 ALPHA and installing TVHeadend plugin i get struggled picture on all channels. like missed frames. Also MKV movie playback works fine without problems … only tv streams missed frames . From that level of detail a) we don’t understand the question, b) could be anything. Please post in the forum with more information. Thanks. Just tried a fresh install of this Alpha on my WeTek play and it hangs at the LibreElec Alpha logo and doesnt finish boot. But installing 7.0.2 then upgradeing to this Alpha seems to work ok.
Kodi Beta 3 is out. Looking forward to the next release! My NUC6i5SYK randomly reboots after I shut it down (using the Power Toggle command on my Harmony Elite). It is connected through a Yamaha AV unit, no HDMI-CEC settings activated in in the AV unit or TV. I have disabled WOL and Wake from sS3 settings and it doesn’t seem to make any difference. Anyone else have this issue?